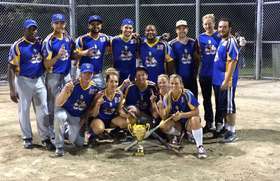 Our adult co-ed league has been operating in Mississauga for more than 20 years. Teams play double headers on Friday and Sunday nights between May and Sept, but only one night a week and usually never on a long weekend. All teams are garunteed 22-24 league games and 4-8 playoff games. The first game on Friday starts at 6:45, the first game on Sunday starts at 6:00. After the regular season all teams are seeded into the play-offs. The top teams play in the championship round to determine the play-off winner, the bottom teams are slotted into the consolation round to determine their winner. The cost to join the league is $1300 per year. $200 deposits are due March. 1, the balance is due April 15. 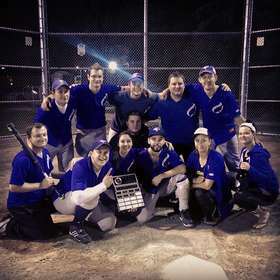 This fee covers our expenses for the city diamonds, city insurance, umpires, balls and each team’s registration with a national slo-pitch organization (usually Slo-Pitch National – SPN). Each team is responsible for their own bats, bases and team jerseys. The league follows SPN rules except where we have made specific changes. Our specific league rules can be found on our web site under Handouts. Up to 24 people can be entered onto the roster. A minimum 3 girls must play defensively and up to 15 people can be in the batting order at one time. Rosters must be submitted by June 22. Minimum age is 18. Our teams have a wide range of ages and a wide range of capabilities (competitive to recreational). Most new teams join the league as a group of friends or coworkers. New teams are welcome in 2015. The league can also accept players wishing to join as individuals or couples. Space for persons looking to join a team depends on each individual team’s need. Because teams often don’t know their own roster situation until the spring, the league can only put individuals looking to join on a waiting list pending teams indicating that they need players. Individuals are asked to provide some information about themselves, this allows teams to pick people who more closely match their team character (e.g. age, competitive level and preferred position). A map of our park locations can be found on our website under Handouts. Please note that the City of Mississauga has imposed a smoking ban on all municipally-owned properties. The new smoking ban impacts all municipal buildings including libraries, museums and transit facilities as well as recreational areas like parks and sporting pitches. More information can be found at http://www.mississauga.com/print/1581222.